Fusion will be the name of the new corps created by the Strutters-Allegiance Elite merger. Fusion's instructional staff will be made up of members of both corps. 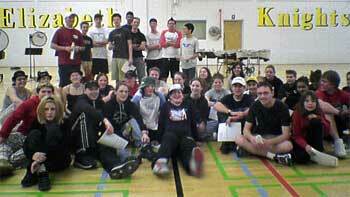 Fusion's first camp, in November, in Calgary, Alberta. "This partnership, formed in November of 2003, is proving to be beyond successful and surpassing any results we ever dreamed of it having. The combining of the staff is a huge benefit to both groups. With knowledge being shared and exchanged freely all involved are sure to end this year on a higher level then they have ever been. The members are being challenged to more degrees than they have ever experienced and very much enjoying the new camaraderie amongst the two groups. We are sure many great memories will be made throughout this endeavor," said Dennie Hirsch, director of the Strutters, who will share Fusion's directorship responsibilities with Allegiance Elite director Jim Deck. Fusion's 2004 program will be called "Essence of Spirit," and it will feature the music of Stephen Melillo. The program's sections will be called "Godspeed," "The Touchstone (a prayer before battle)," "The Chosen" and "Wait of the World." The corps' design team will consist of brass arranger Jim Wells, battery arranger Ian Hale, front line arranger, Robin Fulbrook, drill designer Dennie Hirsch (also a corps director), and color guard choreographers Tanis Lowey and Romee Caro. Fusion's brass staff includes Anthony Bissoon, Stacy Carmichael and Vince Strem. The color guard staff consists of Tanis Lowey, Romee Caro and Tara Kristensen. Dennie Hirsch, Mitchell Hirsch, Ryan Hirsch and Matt Ring comprise the corps' visual staff. Ian Hale (battery), Steve Kress (battery), Troy Davis (battery), Chad McMahon (battery), James Kerr (battery), Robin Fulbrook (front line) and Carrie Gontowiuk (front line) will comprise the corps' percussion staff.